The Civil War was About Slavery - Fact or Myth? All other factors noted, ultimately, the Civil War was about Slavery. The Civil War was about slavery, but it wasn’t “just about slavery”. Sectionalism, Protectionism, and States’ Rights were also major factors. Or phrased another way, slavery was a central factor in the tension leading up to the Civil War, but it wasn’t the only cause for tension (nor was slavery the main stated reason the Civil War was started). To better understand the above claims we can look at writings in and around the time (like those of Lincoln, Douglass, and Calhoun), we can look at state declarations of secession (where for example Georgia, Mississippi, South Carolina, Texas, and Virginia all go on and on about slavery being an issue), we can look at American history including the many compromises revolving around slavery (from the Connecticut Compromise to the Missouri Compromise), we can look at the tension from Jackson’s era to Lincoln’s era (where a main aspect of both the Second party system is slavery), we can look at the parties and their campaign speeches in and around Lincoln’s time (where the Free Soil party was literally named after their position on slavery to distinguish them from the pro-slavery Southern Democrats), and we can look at more current data like a Pew research poll that shows the debate over the causes of secession still linger on today. Slavery wasn’t the only cause of the Civil War, it was simply a central issue of all the tension from 1776 to 1861. The general North/South tension wasn’t all that different from today, one side says its about “small government” one side says that small government side is being immoral and big globalist government is needed. Almost literally, slavery aside, the the tension felt in 2017 was the same in any era. In any era no one can agree on whether social justice is about economics or morality, and no one can agree if rights and liberties speak to protections from government or by government (no different for the Civil War as it was for Civil Rights 1964). Is this a “states’ rights” issue of states having the right to discriminate, or is it a states’ right to offer more protections? No one has ever agreed on an answer. Disagreements over government size, globalism, expansion, and economic factors aside, slavery was a central issue of why the South Seceded upon Lincoln’s election and why the Civil War was fought (it was also the main issue behind a number of other conflicts and tensions building up to the Civil War). After-all, the South had a slave economy. So even though we can many other key factors, we will always have to deal with the truth that there is a central factor of slavery at play here. Sure, the South has always acted like race and slavery weren’t the issue and that big government was, but again… that is essentially American politics as usual (where two sides can’t agree on morality, economics, and the meaning of liberties and rights). TIP: Consider Georgia’s declaration of secession where they cite (in modern terms) Lincoln’s election, slavery, expansion, and big government as the reason for secession. You can see how the two types of Americans have never agreed fully on issues or how to resolve them. There are many aspects to this, and one needs to step in many shoes, but from all perspectives, slavery and anti-slavery is as central issue an issue as government, morality, and economics. The people of Georgia having dissolved their political connection with the Government of the United States of America, present to their confederates and the world the causes which have led to the separation. They have endeavored to weaken our security, to disturb our domestic peace and tranquility, and persistently refused to comply with their express constitutional obligations to us in reference to that property, and by the use of their power in the Federal Government have striven to deprive us of an equal enjoyment of the common Territories of the Republic. This hostile policy of our confederates has been pursued with every circumstance of aggravation which could arouse the passions and excite the hatred of our people, and has placed the two sections of the Union for many years past in the condition of virtual civil war. Our people, still attached to the Union from habit and national traditions, and averse to change, hoped that time, reason, and argument would bring, if not redress, at least exemption from further insults, injuries, and dangers. TIP: Jefferson, he was the type of liberal who tolerated slavery, like Van Buren or even Jackson. Calhoun, he was more like a solid south conservative, he supported slavery and secession (the next generation after Calhoun seceded, but figures like Calhoun helped set the stage). Calhoun might have thought it was ultimately about “big government” oppressing the rural south and not about slavery, but just like liberals didn’t buy the idea that the Goldwater Republican and Solid South Democrat (and later Republican) opposition to Civil Rights 1964 was only about States’ Rights, our ancestors weren’t buying the idea that the tensions leading up to Civil War was only about States’ Rights either. This is to say, the whole pretending like the Civil War had nothing to do with slavery is a modern neoconfederate talking point. And anyway, we don’t have to guess here. This is long before the era of the modern dog whistle, and thus we have a ton of recorded proof that shows the tension was very much surrounding the issue of slavery and race. See: A Documentary Study JOHN PIERCE for more reading. The South Seceded upon Lincoln taking office in 1861, the Civil War began shortly after, and then it wasn’t until 1863 that the first measure to abolish slavery in the South was taken (the Emancipation Proclamation; then the Reconstruction Amendments come after the War). A few state declarations of secession aside, the South was officially fighting for independence (they were generally upset with economic oppression by the North via banks and tariffs and things like that). Meanwhile, the North was officially fighting to keep the Union together (not to end slavery; at first at least). Thus, we can confirm that slavery wasn’t the official reason the Civil War was fought (at first). This does not mean it wasn’t an issue though, in fact, it was the central issue (as we will prove below). People will point to tariffs (like the Tariff of Abominations), the Morrill Land Grants, and a thousand other things to try to spin the Civil War as “not being about slavery,” but the bottom line is the South had a slave economy, and thus every issue circles back to being about slavery. The Constitutional compromises were about slavery, the many additional compromises signed under Clay and Calhoun were about slavery, and when it all came crashing down in Bleeding Kansas that was about slavery too. No, not just slavery, also economic and governmental factors, but at the core, slavery. In other words, the Civil War was about slavery, but it wasn’t just about slavery (it was about rights, differences about government power, differences about banking, economy, taxes, etc). The reality is slavery had been a divisive North/South issue since the founding of the country and talks of rebellion and secession were in the air since Jackson’s time (where Jackson mediated between Calhoun and Clay and the Tariff of Abominations increased tension). In other words, we can look the Bleeding Kansas, or the Free-Soil Party, or the valid points and the propaganda of the Southern Democrats to see many different justifications, and we can even confirm that slavery was hardly the only issue, but we can’t remove the fact that slavery was a central cause of the Civil War. Other major factors for the start of the Civil War that aren’t directly related to slavery included: “how many votes each party would get depending on whether a state was slave or free,” issues of economics (issues of economics between North and South, between States, between slaver and slave, and between wage worker and employer, etc), and thus issues of class (the idea held by some social conservatives in the South being: if the black slave is not the lowest class, then the lowest class is a poor person of any color, which meant the poor rural white and poor rural black would be equally in the lowest class, both then subject to being the “wage slave” of the modernizing citied Northern Bourbon Democrat Liberal and Classical Republican Conservative). In other words, central issues included votes, economics, modernization, and differing cultures (the North wanted a modernized industrialized America with rails, cities, tariffs, and national banks that could stand with Britain as a global superpower, and the South wanted a Young America agrarian democracy with independent banks… and a slave class). Meanwhile, specific things that spurred on the Civil War revolving around slavery included: The Missouri Compromise, Bleeding Kansas, The Dred Scott Decision, the Abolitionist movement, John Brown John Brown’s Raid On Harpers Ferry, written works like Harriet Beecher Stowe‘s Uncle Tom’s Cabin, and Abraham Lincoln’s Election. SEE: Causes Of The Civil War The Events That Caused The American Civil War Causes Of The Civil War Summary. In other words, the tension between the North and South wasn’t just about the morality of slavery (just like it isn’t just about issues of prejudice or private prisons today), it was also about tensions over POLITICAL, CULTURAL, ECONOMIC, and SOCIAL inequalities and general differences between the modernizing Federalist North and Agrarian Anti-Federalist South (it was not just a War over the ethics or morality of slavery, but a War over every issue surrounding it). Consider, the South had a slavocracy, a slave economy, government, and culture. For the South, the end of slavery was the end of their culture and economy and the start of Bourbon Liberals, Reconstruction, and Carpet Baggers. This was known, and was always underlying other issues like tariffs, banks, specific policies, and other very real causes of Civil War. All those factors aside, there is also just the general difference between a rural region and citied region in any era and in any nation (a factor that always causes tension in any nation in history). The Civil War was about issues of social, economic, and political inequality surrounding the issues of chattel slavery, wage slavery, economic oppression, and rights related to Manifest Destiney (which would have expanded the slavocracy) and expansion (and not “just about slavery”). However, that isn’t the only way to describe the complex motives of the 11 rebel states, nor does that comment on the other factions of Lincoln’s time. In the 1860 election, the North and Coasts were in one party, the Solid South in another, the border state represented a middle ground between the pro-slavery and progressive anti-slavery stance. 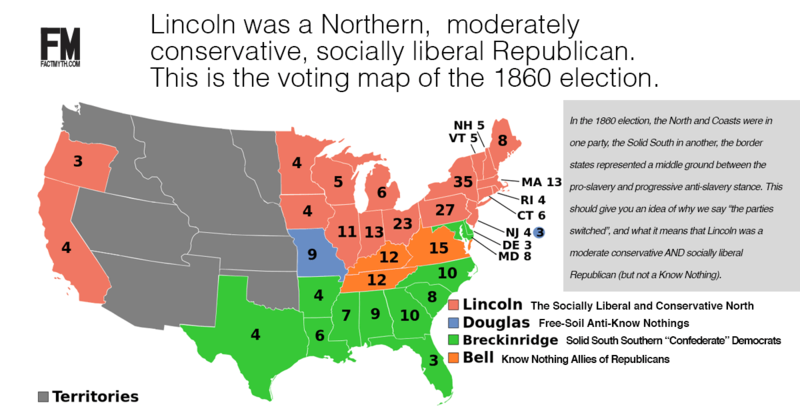 This should give you an idea of why we say “the parties switched”, and what it means that Lincoln was a moderate conservative AND socially liberal Republican (but not a Know Nothing). With that said, no matter how we phrase it, all these factors relate back to slave power, slave culture, the slave economy, and forms of prejudice (so while it wasn’t “just about slavery”, we can truly never disconnect the war from that central issue or its ethical or moral factors). Still, even though each of these major issues comes back to slavery, it is a mistake to see the Civil War as “just being about the morality of slavery”, it was about much more than this (and the same goes for much else in history that seems to be ONLY about the morality of prejudice, for example: women’s suffrage and immigration policy). Even for the many Americans who were morally opposed to slavery, nothing about slavery was just a simple issue of morality. The Civil War (including the tension before and after the events) was also about a number of other complex factors that revolved around the issue of slavery and general economic, social, and political inequality. Thus, the full story is complex. OPINION ON THE CONFEDERATE ARGUMENT: It has become popular to say “the Civil War wasn’t about slavery,” (a phrase generally followed by painting the South as victims of Northern oppression; quickly followed by some twisted logic that says the parties didn’t switch and that modern Democrats are the Confederates). There is some truth in that, but the way that is phrased makes it a neo-Confederate argument. We can call Lincoln a Tyrant, we can look to justify Calhoun, and we can downplay the role of slavery in our history, but if we make those neo-Confederate arguments, we must also know that we are by proxy supporting the Southern Slavocracy. If one wants to discuss the other causes of war, or the ways in which Lincoln abused Federal power, they can, but if they don’t decry slavery and secession with the same breath, then they are essentially spreading Confederate propaganda. The arguments of the founding of the country, to the mid-1800’s, to the century long struggle after all downplayed slavery and up-played states rights and economics. So when we hear that “states’ rights” dog whistle and its argument here in 2017, we should realize it is not new, not clever, and not very Union friendly. How one piece of legislation divided a nation – Ben Labaree, Jr..
You say if Kansas fairly votes herself a free state, as a Christian you will rather rejoice at it. All decent slaveholders talk that way; and I do not doubt their candor. But they never vote that way. – Excerpts from Lincoln’s Letter to Joshua Speed (see the letter for background on the causes of the war from Lincoln’s perspective). What Were the Causes of the Civil War? We can say the South Seceding led to the Civil War, that Lincoln’s election led to the South Seceding, that Bleeding Kansas led to Lincoln, that arguments over States’ Rights and Expansion led to Bleeding Kansas and the Mexican-American War, and political, social, and economic inequality is near the heart of each story, but ultimately everything relates back to a major feature of the old southern culture and economy, chattel slavery. While we can’t remove the issues of race and slavery as primary factors for the Civil War for both the North and South, we can’t honestly discuss the causes for the Civil War without discussing other socioeconomic and political factors including the aforementioned sectionalism, protectionism, and states’ rights. Slavery (Chattel slavery; but also chattel slavery vs. wage slavery, including the South being the wage slave of the North economically). As noted, chattel slavery was the issue at the heart of the southern way of life and their economy. Likewise, a lack of slavery helped define the wage economy of the Midwest and North. Both the actual chattel slavery and aspects of wage slavery were major issues that relate back to all the other points. Protectionism (economic protections and tariffs). Each region of the U.S. can be said to have taken a different type of protectionist stance. Southern states that wanted free trade to expand cotton and other agricultural exports. The North wanted tariffs and exports and though Free-trade was akin to oligarchical wage slavery. The North tended to rack up debt and produce more (like California or New York does today), the South tended to have limited debt but produce less capital (like the South Does today in most cases). Thus, both had different ideas on the role of Big Government and Small Government and Free-trade vs. projectionist trade policies. Both regions were acting as “protectionists” regarding their own economy, but specifically the North was being trade-protectionist and the South Free-Trade (not individuality liberty for the laborer, but “free-trade”). FACT: Lincoln considered himself a “Henry Clay tariff Whig“ and was strongly opposed free trade (which he felt created economic inequality for the working class). Lincoln was in this sense a traditional conservative in terms of trade, a socially liberal National Federalist like Hamilton, Clay, and Teddy. This is the socially liberal, yet conservative, type of politician who favored policies like an income tax, free colleges, and use big Government to ensure the Union (more like a McCain, and less like a modern Free Trade States’ Rights Freedom Caucus Republican; the parties have changed a lot over time). Under free trade the trader is the master and the producer the slave. Protection is but the law of nature, the law of self-preservation, of self-development, of securing the highest and best destiny of the race of man. [It is said] that protection is immoral…. Why, if protection builds up and elevates 63,000,000 [the U.S. population] of people, the influence of those 63,000,000 of people elevates the rest of the world. We cannot take a step in the pathway of progress without benefitting mankind everywhere. Well, they say, ‘Buy where you can buy the cheapest’…. Of course, that applies to labor as to everything else. Let me give you a maxim that is a thousand times better than that, and it is the protection maxim: ‘Buy where you can pay the easiest.’ And that spot of earth is where labor wins its highest rewards. – William McKinley speech, October 4, 1892 in Boston, MA William McKinley Papers (Library of Congress) McKinley espousing The Republican Party stance pre-Southernization. States’ Rights (popular sovereignty, States’ Rights Jeffersonian Federalism). Originally the South and Anti-Federalists and then Democratic Republicans, and then Democrats were generally for States’ Rights Federalism and the Federalists, National republicans, Whigs, and then republicans were for central, protectionist, modernized, industrial, finance driven, Northern government. Nothing much changes about that until after Teddy Roosevelt. So in this era, we are talking about a States’ Right to not be told what to do about slavery, States’ Rights to be a slave state, States’ Rights to expand, States’ Rights not to be subject to tariffs, and for the liberals “a states’ rights to have reformer Communes and worship freely or be a Mason” (today, post solid south switch and religious right activism, that gets confused). Manifest Destiny and Expansion (the Destiny of expanding America). America never really stopped expanding under the Democrats or Republicans despite isolationist stances of some Presidents. With that said, expansion was often a partisan issue, especially leading up to the war when it became a tug-of-war over whether a state would be free or not. Votes, votes, votes (when it isn’t about money or ideology, it is about votes). Everything comes back to three things 1) Money, 2) Ideology, 3) Votes. It is largely though first and foremost about votes. If you own some people and those people count as 3/5ths a man then you have more voting power. If you have more voting power then you get your way on the above. Learn more about the history of the black vote. In other words, when we say “Slavery was not just a moral issue for either the North or South, and slavery was not the only issue at the heart of the Civil War” we mean that all the above were also major related issues. With all the above in mind, it is actually a Neo-Confederate talking point to not recognize that slavery is the core issue, just as it was a Confederate talking point to downplay the morality of slavery when-back-when. If you can accept all those views at once, good luck understanding American history. Ken Burns: The Civil War was about ‘slavery, slavery, slavery’. Ken Burns is right here to hammer home the point that the Civil War was about slavery. If you understand history then you know how central the issues of slavery and race are to our history despite all the other factors. Not every faction of 1860 Republicans was saintly or moral to say the least, but ignoring the slavery aspect is a neo-Confederate tactic. An Introduction to John C. Calhoun’s Disquisition on Government’s – A Macat Politics Analysis. TIP: If your argument is literally Calhoun’s argument, then it is also the confederate and neo (in this case meaning “new”) Confederate argument. Slavery at the Constitutional Convention HD. The video mentions the awesome, but not often discussed founder Gouverneur Morris. IT WAS A NEFARIOUS INSTITUTION-It was the curse of heaven on the States where it prevailed. Compare the free regions of the Middle States, where a rich & noble cultivation marks the prosperity & happiness of the people, with the misery & poverty which overspread the barren wastes of Va, Maryd, & the other States having slaves. – Gouverner Morris 1787… don’t go thinking all the founders supported slavery. Consider also the Free Soil Party and the Populist Democratic Party and Northern Democratic Party factions. Consider also the Know-Nothings of the North. History is complex. The Real reason slavery “Ended” the Truth about the “civil” war. This guy is 100% not correct in that he is conflating the northern business-minded oligarchs and more petty aristocrats who cared more about political power than social issues with all the socially liberal and progressive factions that fought to abolish slavery since before 1776 (like Hamilton and Morris). I’m telling you, the Civil War was about slavery, but not just the morality of it for all people (so he makes good points, but gets some of it wrong). Still, for the progressive liberals of the old days, it was most certainly a moral issue and not an only an economic one (if it was economic at all). And, by the way, taking over parts of Mexico was also a moral issue that social liberal elite Republicans like Lincoln fought against. Think of it this way, in any era the same types of people exist, sometime they get radical like in 1850, sometimes they are calm like in the early 1820’s, but people are always the same at their core (coming in different natural types). TIP: Points to the contrary have been being made since before 1776 and at best dance around the issue of slavery. When one explains the Civil War in a way that makes the Rebel Confederate South look like a friend of the black man (living together is notable, but “friend” is pushing it) or when they try to explain away or rationalize slavery they are making a “neo-Confederate argument” (the new version of the old confederate argument; which also tried to justify slavery and related racial prejudices). Was the Civil War About Slavery? Men are from Mars, women are from Venus, PragerU leans toward Goldwater Republican, and I lean toward being a Bernie Progressive. Are PragerU fully wrong to make a somewhat neo-Confederate argument? Probably not, although I’m not fully comfortable with what they are implying here. Is the argument that the Civil War isn’t about slavery an alternative fact born from the conservative coalition’s southern strategy? Something like that in my opinion, but there are valid points to be made none-the-less. The facts speak for themselves, and its important to hear both sides of the argument. As, in any era, there will always be more than one way to frame an argument. The southerner at the time was worried that without the slave economy (inherited by from the British during the global Atlantic slave trade), the North would turn the poor white man into the wage slave of the Northern elite oligarchs and aristocrats (see “the slave power” argument used to slander Radical Republicans). I know, I know, crazy right? Turns out that is exactly what happened in the Gilded Age after the Union crushed the Southern Slaveocracy and implemented Military Reconstruction (it is during this era that the KKK arises). This is to say, the North (the Democrats and Republicans of the Union) typically made slavery a moral issue on one hand and sort of ignored the economic, social, and political issues of the South on the other. Likewise, the South (ex-Democrats, no Republicans, AKA Confederates) tended to ignore or rationalize the moral aspects of slavery and focus on the economic issues and the populist elitist divide between the two parties (the Democrats populist and Republicans more aristocratic). Thus, most issues related to slavery were economic, and they were generally related to expansion, States’ Rights, and popular sovereignty. They were about sociopolitical power and modernization. And about a general way of life. At all times they were related to slavery, but they were rarely about “slavery” alone. The idea is that the Northern aristocratic Federalist, National Republicans, Whigs, and Republicans wanted to retain power and form a unified central government driven by debt, wage labor, and modernization and the socially conservative Democratic Party south and some of their liberal Democratic Party allies in the North and South wanted an agrarian, debt free society. The best way to expand power was to Polk around toward the south, manifesting Density and expanding… but this wasn’t just about expansion, this was about slavery too. The same goes for all the compromises from the Connecticut to the Missouri. Because a slave is actually a man (and not an inanimate object that one might consider property), and because a man has a vote (be it 3/5ths in that day or 1 whole vote in this one), and because one of the two parties of the two party system always had the black vote, all issues of race have always been about politics, and much of politics has been about race. That is just the way it is historically speaking. An Thomas Jefferson and John C. Calhoun: Southerners by William Wilson. Not all southerners are evil pro-slavery cartoon chariactures. Mind blowing, right? Turns out all flesh and blood people were created equal and most will manifest civility if not kept in wage or chattel slavery and allowed access to dignity and education. So yes, the Civil War was about race and slavery, but it was also about economics, about votes, about expanding and shrinking power, about modernization in the age of oligarchical industrialization, fears, freedoms, morality, and amoralism. It was a complex and mixed bag, but it was about slavery and race. Today the neo-Confederate argument includes ideas like “the Civil War was about States’ Rights or Wage slavery or that the Wage slavery of the North is worse than the Chattel slavery of the South, that the African is better off in America, that the South treated the African well, etc, etc”. Those points are just as valid today as when Calhoun made them in the 1840’s (which would be partly valid or pretty invalid according to your tastes), but their merit aside, the point here is that those neo-Confederate arguments are not new. We know historically that those sorts of arguments led to bloodshed and the enslavement of human beings, so merits aside, this should be noted! For this reason, and for history as it happened, we cannot and should not separate race and slavery from Civil War, nor should we separate it from Social Justice and Civil Rights. Yes, States’ Right Federalism is important. Any old democrat liberal or conservative is going to agree on that to some extent, just like many modern Republicans would. However, that Goldwater form of States’ Rights Federalism that dips a toe in the neo-Confederate argument is not “just about States’ Rights” any more than the Civil War was just about “favoring a Confederation over the Central Government heavy Dual Federalism“. Learn more about the founding Federalist and Anti-Federalist factions for more on North/South stances on slavery and federations or see the story of the changing major political parties in the U.S. Causes of the Civil War Part 1. FACT: Essentially none of the founding fathers supported slavery. Originally the worst forms of chattel slavery in America were limited to the deep south. The problem starts with the second and third generations of Americans who fail to settle the issue but must deal with expansion. It all then comes to a head under Lincoln (who upon being elected causes the then 11 Confederate South states to secede). Causes of the Civil War Part 2. The Civil war wasn’t JUST about slavery, but it was most certainly about slavery. To think of the South as evil villains is to really only see one viewpoint, one has to consider all aspects of the war. With all aspects considered, we can see clearly that the Civil War and much else of American history is “about slavery and/or race”. Warm bodies are employable and can cast a vote, thus they are a political issue be they women, black Americans, immigrants, or what have you. 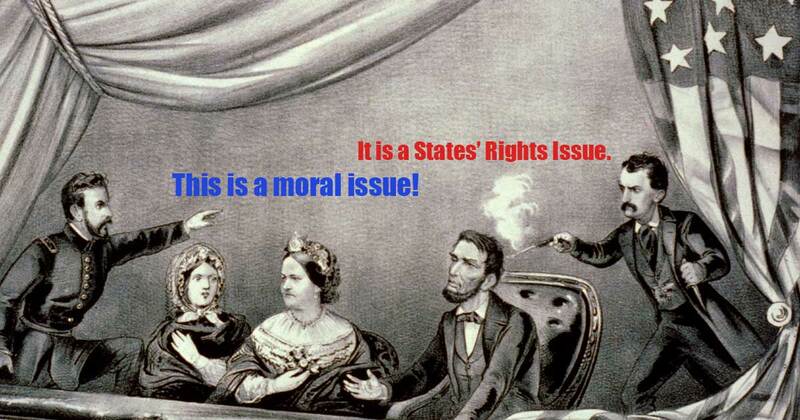 In other words, slavery was a moral issue for some, but history is more complex than a disagreement over morals. The reason slavery is an issue is because the subject related directly back to social, economic, and political power for both major political U.S. parties in the two party system. What did sectionalism have to do with the American civil war? Thank you for the compliment on the site. As to the comment, I don’t think we can discuss American slavery without discussing the economic factors (and thus wage slavery and the nature of a pyramid shaped capitalist economy). If the slave isn’t the lowest rung of worker, then someone has to be. Leading up to the Civil War and during Reconstruction there was a sentiment in the slave states that “the Northern Republicans just wanted to free the slaves so they could rule over both the the poor white and black man”. That theory may have been steeped in prejudice, but there was some logic there. There always has to be a lowest class, in America one of the lowest classes was the rural farmer, with no slave class then the rural southern and mid-western white man works the fields, the owner cuts a deal with citied oligarchs for trade, and everyone takes a diminished cut all the way down the totem poll. We both share the same logic and view generally it seems, I am only cautioning that we have to distinguish between wage slavery (what the wage worker who takes the place of the slave at the bottom of the pyramid experiences, which is mainly immoral only when the wage is low enough, from chattel slavery, the purely immoral forced labor and ownership of humans). The Gilded Age that follows the Civil war tells us a lot, a class of cronies and oligarchs arose after the war, and the poor whites, blacks, and immigrants laid the tracks that drove the train that carried the goods that the industrial class profited off of. That class profiting was often Bourbon or Republican, indeed, there was some truth in that old Calhoun logic despite the unacceptable racism in which it was steeped. Today when we talk about “getting illegal Mexicans out” we are having a similar conversation. That cheap labor is done by “others”, to replace it means to replace it by either/or less profits, low wage nationals, or machines/automation (like the railroads in the 1800’s). We can see the welfare state as the safety net that catches those who fall down when automation or hard times take their jobs, or we can see it like low wages (as a system which keeps people trapped under an economic net). I personally see a healthy safety net as more a “trampoline to bounce people back up” than “a net with which to trap”, but there is a conversation here. The arguments and reasoning for doing X or Y with the lowest class of rural worker in any era changes, but in all cases it has direct implications for the people next in line to take their place and for those who profit off the labor (not just factors of economics, but factors of pride, prejudice, class, and status). These factors weigh heavily into any conversation about prejudice policy and economy in our history and in modern times… but let us not belittle chattel slavery by conflating it with wage slavery. Wage slavery is much less immoral, despite being troublesome on many levels. Slavery was a part of the Civil War but not the only reason for the start of the war. 100% agree, really tried to support that argument above. Thanks for the comment.